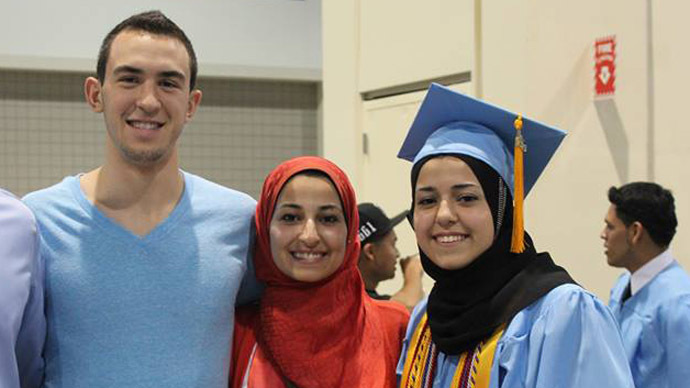 The three young relatives in the college town of Chapel Hill were gunned down in their home on Tuesday evening. The victims in the triple homicide have been identified as Deah Shaddy Barakat, 23; his wife, Yusor Mohammad Abu-Salha, 21; and her sister, Razan Mohammad Abu-Salha, 19. All three victims were shot in the head. A 46-year-old man identified by police as Craig Stephen Hicks turned himself in late Tuesday night. He was subsequently arrested on suspicion of three counts of first degree murder. 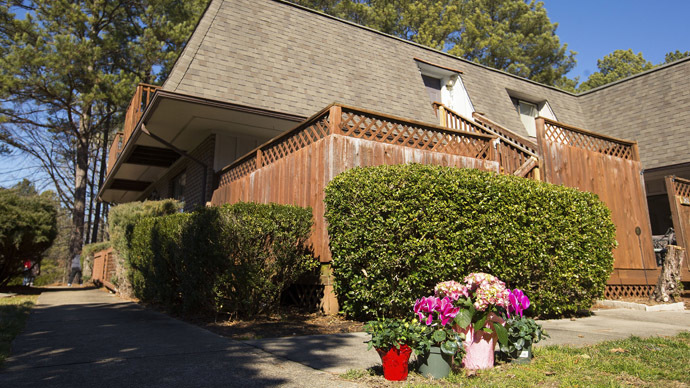 Hicks lived next door to the family in a condominium complex a few miles east of the University of North Carolina’s flagship campus. The women’s father, psychiatrist Dr. Mohammad Abu-Salha, told the Raleigh News & Observer that, while parking may have been the catalyst for Tuesday’s events, the shooter had an underlying animosity towards his daughters and son-in-law based on their religion and culture. “Honest to God, she said, ‘He hates us for what we are and how we look,’” he said. Both women wore hijabs, the traditional Muslim head scarf. While police noted Wednesday morning that the killings were likely part of an ongoing parking dispute, they added that they have not ruled out the possibility that it was a religiously motivated attack. Durham District Attorney Roger Echols also said that law enforcement has not eliminated any motives at this point. "All motives will be under investigation," Echols said, according to WRAL. Hicks' wife Karen denied that her husband was motivated by Islamophobia, but rather by the parking situation at the condominium complex. "This incident had nothing to do with religion or the victims’ faiths," Hicks’s wife told reporters at a news conference Wednesday afternoon. She added that the shooting came as a "complete shock" and she expressed her "deepest sympathy and condolences" to the victims’ families, WTVD reported. Hicks’ attorney also stressed that the family does not believe the shooting was a hate crime. "It has nothing to do with terrorism. It has nothing to do with anything but the mundane issue of this man being frustrated day in and day out and not being able to park where he wanted to park," said attorney Rob Maitland. "These victims were there at the wrong time and wrong place." Both Karen Hicks and Maitland mentioned mental illness as a factor. Parking was a recurring issue between Hicks and his three victims, but it never escalated to the point of involving law enforcement, Chapel Hill police told WTVD. 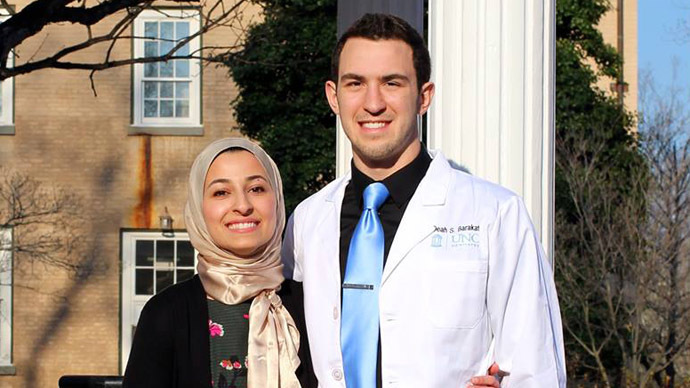 “I talked with the brother of Deah Barakat who was shot, and he told me that allegedly this neighbor had gone into this apartment before, over parking, and this was an issue that they had dealt with in the past,” WUNC’s Reema Khrais reported. On Tuesday evening, one 911 caller heard eight shots; another reported between five and 10 shots after she heard “kids screaming,” according to released recordings of the calls. Neighbors have described the parking situation as “confusing,” WRAL reported. While many across social media and in the Muslim-American community called on law enforcement to investigate the incident as a hate crime, local officials sought to calm fears of an outbreak of violence against those who practice Islam. "The events of yesterday are not part of a targeting campaign against Muslims in North Carolina," US Attorney Ripley Rand told reporters at a news conference Wednesday afternoon, adding that there is "no information this is part of an organized event against Muslims." "This appears, at this point, to be an isolated incident," Rand said. The Council on American Islamic Relations (CAIR) called on federal authorities to investigate the slayings and address a “possible bias motive” for them. "Based on the brutal nature of this crime, the past anti-religion statements of the alleged perpetrator, the religious attire of two of the victims, and the rising anti-Muslim rhetoric in American society, we urge state and federal law enforcement authorities to quickly address speculation of a possible bias motive in this case," said CAIR National Executive Director Nihad Awad, according to WTVD. Currently, federal law authorities are assisting “merely in a monitoring capacity at this point," Rand said. They are helping process evidence, which is standard in homicide cases, WRAL reported. Hicks was arraigned Wednesday morning. Durham County Judge Marcia Morey denied bond, and scheduled his next court appearance for March 4. Hicks was originally being kept at the Durham County Jail, but was later moved to the state’s Central Prison. Authorities have not elaborated on why. Vigils for the victims are planned at UNC and at North Carolina State University, where all three received their undergraduate degrees.